In a couple of weeks I’m attending a (private) seminar on Lessons from the History of Whitehall Performance Measurement Systems. I have fairly well developed views of my own on this already, but I’d be very interested to get any input from colleagues, especially those with “insider knowledge” of how these things have worked and evolved. 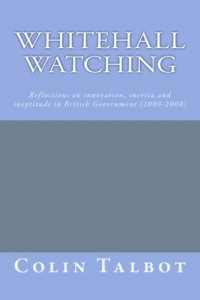 – a paper I did for the World Bank’s Independent Evaluation Group – Performance in Government. – a blog setting out how the Coalition Government, despite claiming to have ditched Labour’s “target culture”, has in fact invented one of its own: Targets? What targets? Change and Continuity in the performance regime in Whitehall (although a recent Institute for Government study suggests they are not taking their own Business Plans very seriously). So any comments, analysis, anecdotes gratefully received: either by way of comment here, or you can email me if you want to be anonymous (colin.talbot@mbs.ac.uk).